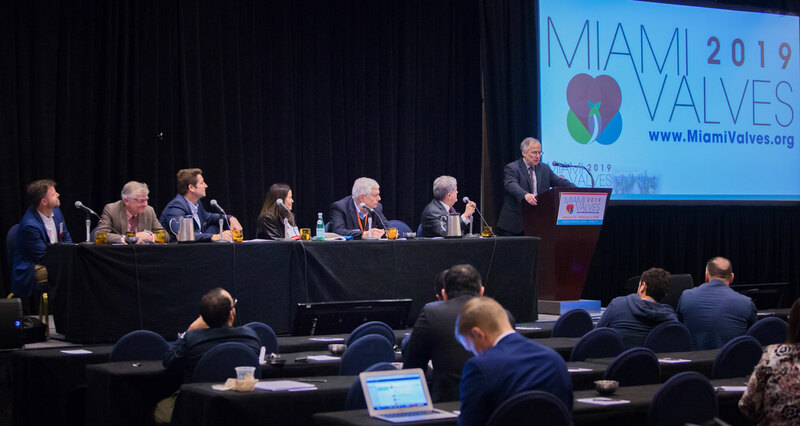 New biomedical devices and advances in cardiac procedures are improving outcomes for patients with heart disease, according to leading researchers and clinicians at Miami Valves 2019, an annual international conference hosted by the University of Miami Miller School of Medicine January 30 to February 2 at the InterContinental Hotel. 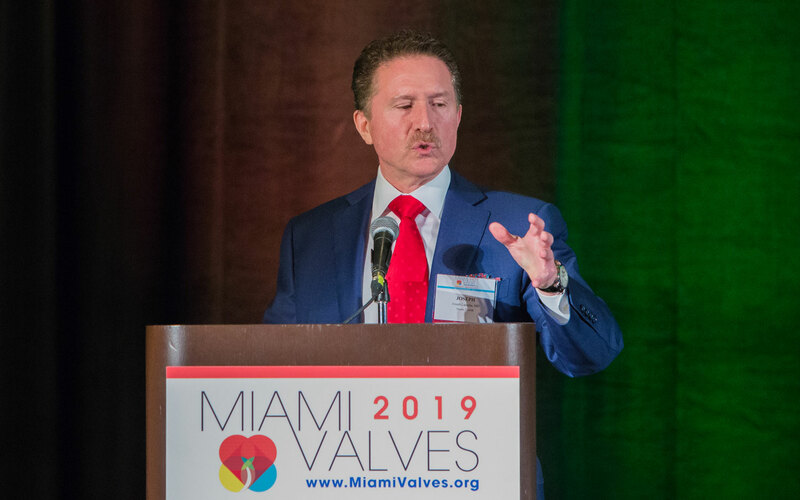 Miami Valves 2019 attracted leading researchers and clinicians from around the world. More than 360 physicians and other health care professionals from 97 institutions throughout the Americas, Europe and Asia attended the four-day conference on “Advancements in Transcatheter Techniques for Valvular and Structural Heart Disease.” Eberhard Grube, M.D., professor of medicine, and chief of the Department of Cardiology and Angiology at Siegburg Heart Centre in Bonn, Germany, received a lifetime achievement award. “Year after year, Miami Valves continues to grow without losing its friendly atmosphere,” said Giselle Baquero, M.D. a former Miller School structural cardiology fellow who is now an assistant professor at Southern Illinois University. One of the many well-attended sessions was an update on transcatheter aortic valve replacement (TAVR) by Dr. de Marchena, who was course director of the conference. Joseph Lamelas, M.D., UHealth’s new chief of cardiothoracic surgery, spoke about minimally invasive mitral valve surgery. Other trends include a reduction in mortality rates and hospital length of stay, he said, adding that 80 continues to be the median age for TAVR patients. “With the aging of the boomer generation, we expect to see greater need for TAVR procedures in the next decade, he added. In his talk on “Minimally Invasive Mitral Valve Surgery,” Joseph Lamelas, M.D., UHealth’s new chief of cardiothoracic surgery, discussed the advantages of direct access to the heart through a small incision on the right side of the chest. Dr. Lamelas said being able to see the mitral valve directly helps him determine the most appropriate treatment, such as inserting a device to reduce mitral regurgitation, tying a “sling” to bring muscle tissues together or debriding calcium buildup on the valve. Dr. Badiye was among the 35 Miller School faculty members who participated in the conference, along with renowned researchers such as Greg Stone, M.D., from New York-Presbyterian, who discussed using the new MitraClip to treat heart failure patients with mitral regurgitation in the multi-site COAPT trial, called the most impactful structural trial of 2018. Dr. de Marchena and Peter de Jaegere, M.D., Ph.D., of Erasmus Medical Center in The Netherlands, co-hosted the opening “Ibis Tank” session, modeled after the popular TV show, “Shark Tank.” A panel of clinical, engineering and business professionals provided feedback on eight brief presentations of eight promising therapies and devices. 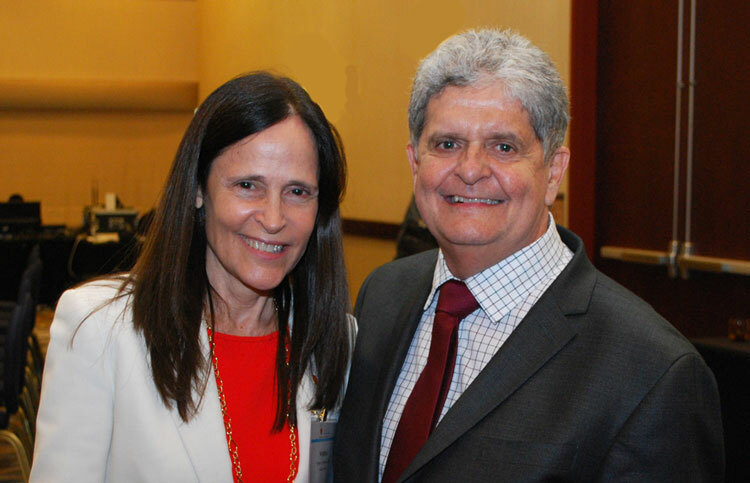 From left, Norma Kenyon, Ph.D., with Eduardo de Marchena, M.D. Joshua M. Hare, M.D. spoke about using a specific combination of mesenchymal and cardiac stem cells for treating heart failure. Following the Ibis Tank presentations, Norma Kenyon, Ph.D., UM vice provost for innovation, led a “Cardiovascular Innovation Workshop,” which focused on ways to accelerate the translation of laboratory research to patient care. “A clinical trial is typically just the beginning of getting new therapies and treatments to people,” she said. Other Miller School conference presenters included Lilian Abbo, M.D. ; Felipe Albuquerque, M.D. ; Eugene Bauerlein, M.D. ; Joao Braghiroli, M.D. ; Nicolas Brozzi, M.D. ; Sandra Chaparro, M.D. ; Michael Dyal, M.D. ; Imran Farooq, M.D. ; Alexandre Ferreira, M.D. ; Ali Ghodsizad, M.D. ; Jeffrey Goldberger, M.D. ; Joshua Hare, M.D. ; Litsa Lambrakos, M.D. ; Alexander Llanos, M.D. ; Matthias Loebe, M.D., Ph.D.; Brijeshwar Maini, M.D. ; Brigitte Marciniak-Bednar, RN, BSN, CCTC; Christian Marin, M.D. ; Pedro Martinez-Clark, M.D. ; Saqib Masroor, M.D. ; Cesar Mendoza, M.D. ; Robert Myerburg, M.D. ; Vicente Orozco-Sevilla, M.D. ; Valrie Reid, Ph.D.-c, APRN-BC; Jean-Louis Renaud, APRN; Nina Thakkar Rivera, D.O., Ph.D.; Paolo Rusconi; Tomas Salerno, M.D. ; Satinder K. Sandhu, M.D. ; Alan Schob, M.D. ; Neeraj Sinha, M.D. ; and Bin Yan, Ph.D., J.D.